As seagulls glide over the beach and their squawking echoes in the air, the sun disappears behind the horizon, and the street lights turn on automatically. You can hear the crackling sound of the stores’ rolling shutters and the Mediterranean breeze caressing your cheeks. Nearly every day ends this way in the coastal town of Anzio, just over an hour south of Rome. Anzio sees different scenes each season, but its soul has remained the same since the Romans decided to come here to rest their political minds and enjoy the Mediterranean lifestyle. Anzio has been of historical importance since the days of the Romans, when politician Cicero kept his books here, a safe distance from Rome. The former Roman emperor Nero was actually born here, and on your trip, you can view the ruins of his aging — but still beautiful — beachside villa. In the 1800s, the wealthiest Roman families, just like their ancestors, came here on vacation, drawn by the bourgeois houses and the casino. During the Second World War, the American forces disembarked on the coast to liberate the population from the Germans in what is now called The Battle of Anzio. Today, the casino is nothing more than a sumptuous palace facing the sea, but Romans maintain the habit of spending a few weeks on the beaches of Anzio in the summer, or a day of dolce far niente and seafood during weekends. As a foreign visitor, you’re advised to once again do as the Romans do and escape the big-city grind for a day of seaside relaxation. From Rome, board the train to Nettuno from the Termini station. There’s one every 30 minutes to an hour, depending on the season. Get off at Anzio station, which is the second to last stop. From there, walk downhill until you reach the square less than five minutes away. Tickets are 3.40 euros, and the travel time is usually one hour and 10 minutes. You can check times and buy your ticket on trenitalia.com. There are more than 60 restaurants downtown, the vast majority of which specialize in seafood. 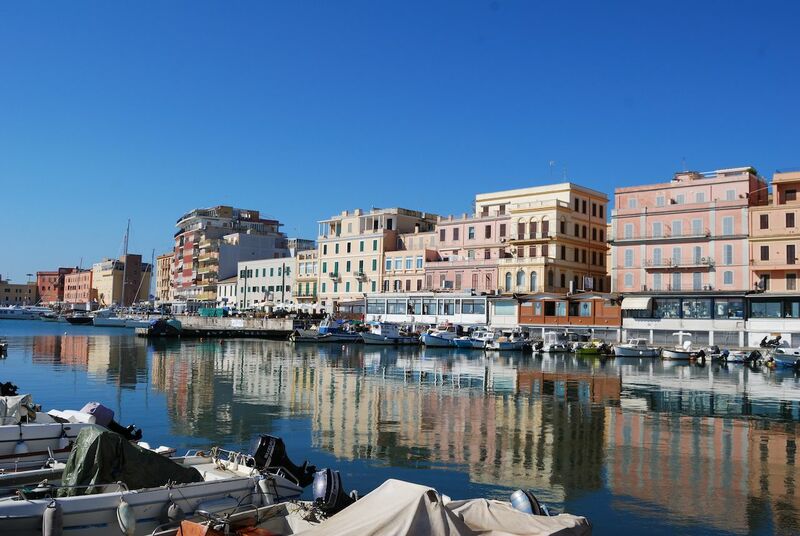 It’s no surprise considering both the towns of Anzio and Nettuno, an adjacent town with a charming Medieval village, have harbors dotted with fishing boats of every size that distribute their catches across the region. 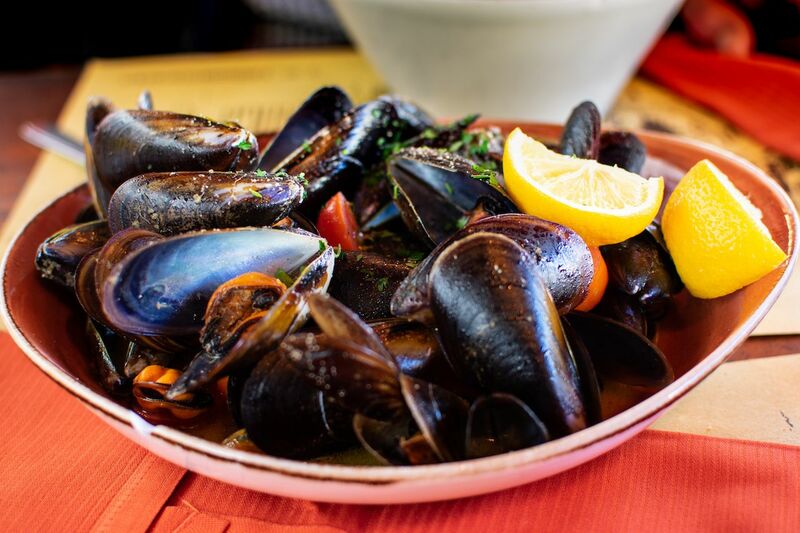 Walk beside the harbor, and just a few yards from the main square you’ll start to notice restaurants offering both table d’hôte and à la carte. You can’t go wrong, but be sure to check the prices outside if you’re on a budget: Some can be expensive and attract celebrities and soccer players (€50+), while others are more mid-range (€20-40). No matter your budget, just follow the sound of silverware clinking and don’t forget to order antipasti and a bottle of white wine. Get gelato and go for a walk. Anzio’s main square has a fountain in the middle surrounded by trees, shops, and plenty of marble benches to sit on. 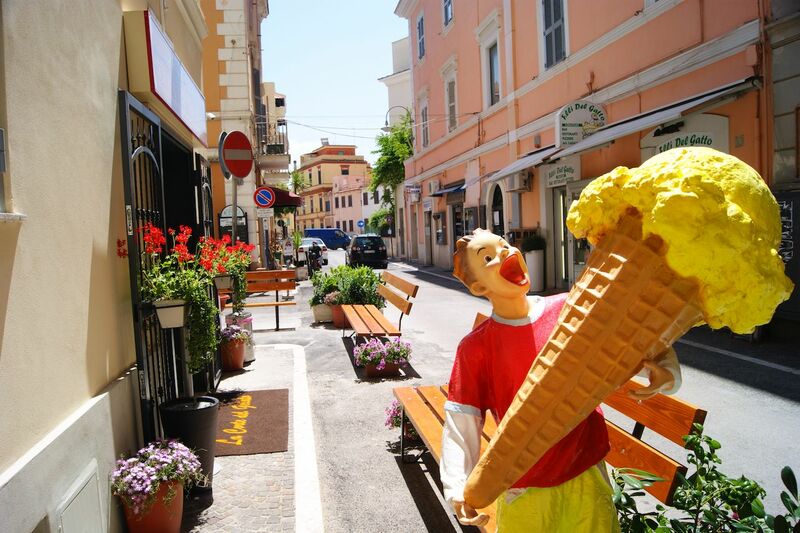 To get in the Italian vacation mood, get yourself a gelato from one of the many gelaterias scattered around the square. You’ll have no problem finding one — there are so many that it seems as though the rules of supply and demand don’t really apply here. While you dive into your gelato, you can walk to the beach (follow the sun and you’ll find it) or just sit somewhere in the square. This is the best place for people watching as kids play soccer and blow soap bubbles while parents and grandmas chit chat about the wedding of the fruit seller’s son — or another such forthcoming event. Watch the day go by in the square without the souvenir shops and crowds of the major city to the north. Summer or winter, get down to the beach. Summer months in Anzio draw many people from nearby cities, especially from Rome. You, too, can rent an apartment or stay in one of the bed and breakfasts near the beach. On summer nights, the cafes and bars fill up quickly and the city comes alive with socializing over evening dinners and bottles of wine. In winter, the city tends to sleep all week long, though most businesses remain open. You can use this to your advantage as the shops are empty, and the beaches are free of towels and folding chairs. The sunset in Anzio has SoCal vibes, minus the skaters and Instagram influencers. Check the sunset time beforehand and head to the beach in advance. 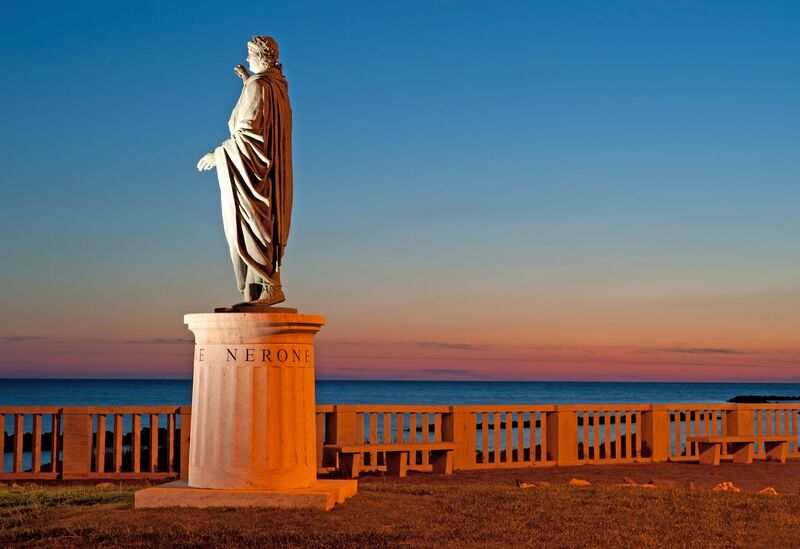 Walk on the promenade until you reach the small park, then take the stairs and walk to the Nero statue — this is one of the best spots to watch the sun go down, and man, is Nero one lucky guy getting to see it every day. You can also go further down and walk along the concrete boardwalk that stretches out about 20 yards from the foreshore. 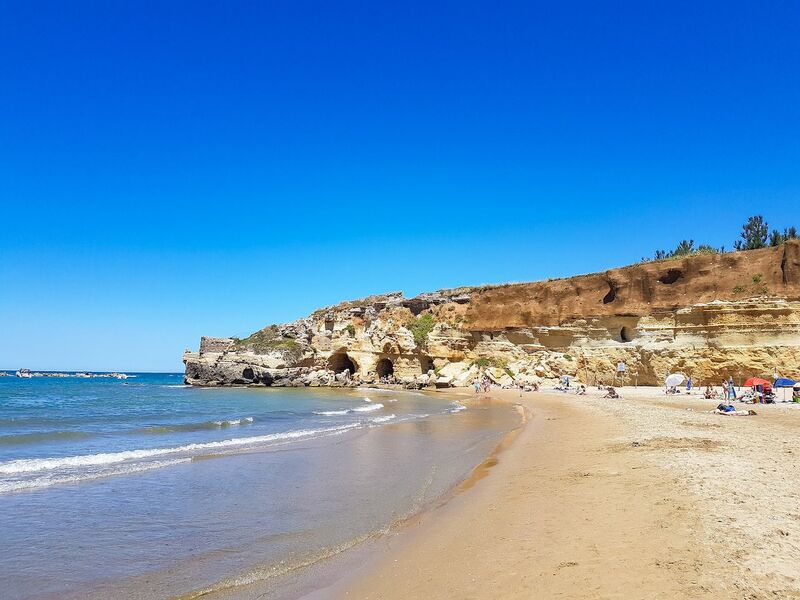 Alternatively, follow the beach and explore the Roman ruins on which you can freely walk and catch the sunset from there; it’s a gorgeous site no matter where you settle in.